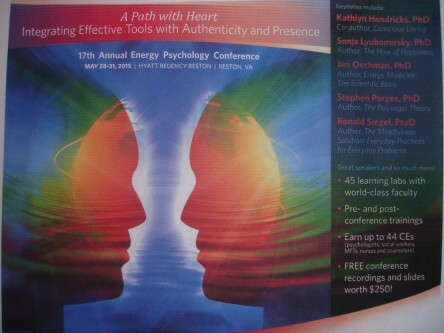 Transforming Grief: Integrative Tools to Assist the Client & Practitioner is the preconference workshop that I will be co-presenting with bereavement counselor Sherry O’Brian at the annual Association for Comprehensive Energy Psychology meeting on Thursday, 5/28/15, in Reston, VA. We both gave popular breakout workshops on energy psychology and grief at last year’s conference, so we were invited to combine our approaches in an all day workshop this year. This conference features many of the top tappers in the world, and it offers APA credits to psychologists, a breakthrough which I previously highlighted in my Tipping Point For Tapping HuffPost blog. ACEP certification is offered in energy psychology as I describe in the excerpt below from Chapter 14 of Let Magic Happen: Adventures in Healing with a Holistic Radiologist. More details about certification for mental health and non-mental health professionals and lay people can be found here including EFT and energy psychology certification workshops at the conference. It is also a great place for Networking with Like-Minded Holistic Practitioners as described in the January 2015 Let Magic Happen blog. As my practice continued to grow, it seemed appropriate that I should get an official certification through the Association for Comprehensive Energy Psychology (ACEP) for my work with EFT. They offer a program that leads to becoming a Certified Energy Health Practitioner (CEHP). It requires studying background material that includes information on ethics, and then I had to pass an online test, and attend a certification workshop. The final step was accumulating 20 consultation hours of mentoring by an approved consultant. Gary Peterson, a local psychiatrist specializing in both EMDR and EFT, was helpful in guiding me through the process. The ACEP conference features preconference & postconference workshops, breakout sessions, and special invited presentations.